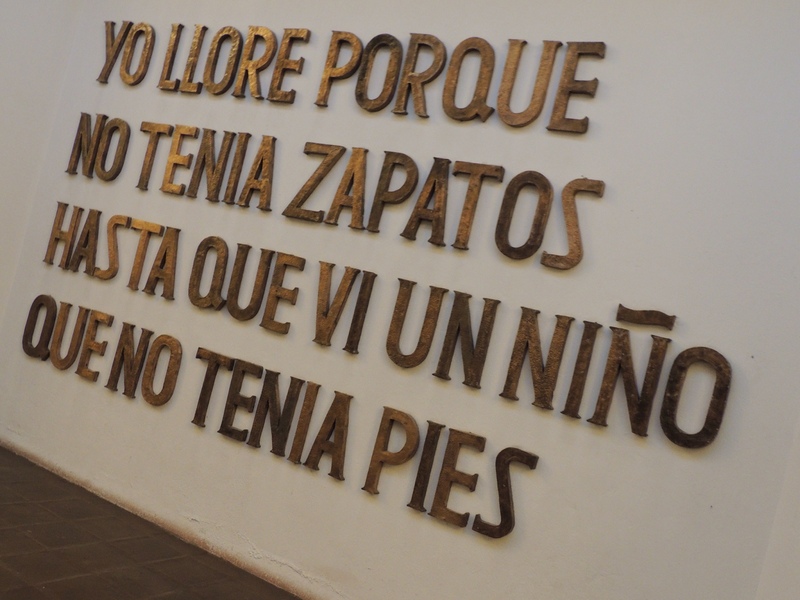 ‘I cried because I had no shoes, until I saw that the child had no feet’, moving artwork from La Capilla del Hombre, Casa de Guayasamin, Quito, Ecuador. Admittedly, Quito was by far my laziest venture into a South American capital city so far. I dragged myself up there from Latacunga on a late morning bus and was welcomed into the city’s southern terminal with a refreshing (and not unusual) equatorial downpour. Quito is oddly shaped because of its location in a long, thin plateau flanked by several volcanos which are all visible from the city on a clear afternoon. The city’s shape means that whichever bus terminal you arrive at (either the Norte or Sur) is at least an hour from the city centre by public transport, which takes some planning for those arriving by bus. It is also officially the highest capital city in the world, which negates what I have previously written about La Paz, however, I still consider Bolivia’s best city to be a whole lot cooler so I’m sticking with what I’ve said before despite the technicalities. Despite our proximity to the equator and my romantic notions of beautiful sun-filled afternoons, Quito provided almost the opposite. Every afternoon at around 3 o’clock, the heavens opened and we were treated to a repeat of the previous afternoon’s weather. This did nothing, however, to dampen the spirits of the locals when it came to the World Cup Qualifying Finals; when Ecuador qualified for the first time in 16 years anybody would have been forgiven for thinking that they had actually won the competition. But it did give the South Americans an opportunity to remind us all that they knew how to throw a street party. Braving the weather, we ventured into one of Latin America’s best preserved colonial city centres after being reunited with some friends from Mancora, Sophie and Jakob. Happy to let someone else lead the way for a day, I lazily agreed that their plan to visit Casa de Guayasamin was a great way to fill a day – and how pleasantly surprised I would be with that choice. Two more awesome travel buddies, Bolivia-boat-hitchhiking-Kyle and Nick (who I later met in Cusco) joined us in Quito, and suddenly we had quite the mochillero tour group. Upon arriving at Casa de Guayasamin I was completely ignorant to Oswaldo Guayasamin’s importance within his home country, Ecuador, and elsewhere. A master sculpted and painter, the preservation and dedication to his life’s work includes his home and studio exactly as they were left when he died, along with a separate museum, La Capilla del Hombre (The Chapel of Man) housing the largest single collection of his work in the world. His art exerts one of the most unique styles I have seen in Latin America, and combined with the stunning location of his house and works exhibited high above the streets of Quito, it was one of my favourite museums to date. More information can be found on the website, here. Enjoy the short gallery (below) and look for the next post from the Mitad del Mundo, the centre of the world! Brilliant photos – such vibrant colours!